Calendars are the basic requirements which are needed by everyone. Now with the introduction of printable calendars, the landscape if calendars has undergone a change. People now just have to choose a template from the variety of options, such as weekly, monthly, yearly, etc. and just write their schedules in it. Not just this, printable calendars provide added advantage by increasing the visual aesthetics of a place and can complement your home decor. #1 Amazing 3D Printable Calendars. Want to bring your calendars to life? Then this calendar is perfect for you. 3-D designs are easy yet eye-catching way you can use for your calendar. You can take any cardboard and create a geometric design with 12 faces in it. You can write down the important dates and events for each month on each side of the calendar. This idea is perfect for creating calendar for your desk or for gifting purpose. If you gift this to someone, they will surely like this new twist to the calendar. If you like simple calendars for yourself yet want to add a twist to it, you should definitely try this idea. This calendar us designed in journal style, and you can make notes of the important tasks of the day in it. This will really look pretty in your room or you can even gift it to your near or dear ones. You can you use a wheel of an old bicycle to turn into a calendar. You can attach a chalkboard onto the bicycle wheel and use the segments of the wheel to make calendar for each month.This is really an efficient and creative calendar idea and can spruce up the decor of your room in no time. This calendar also has a chalkboard, so you can change your schedule daily and customize it according to your preference. No one will expect to see this design of a calendar in your room! The canvas that we use for our drawing or sketching can also be used as a calendar. Wondering how? 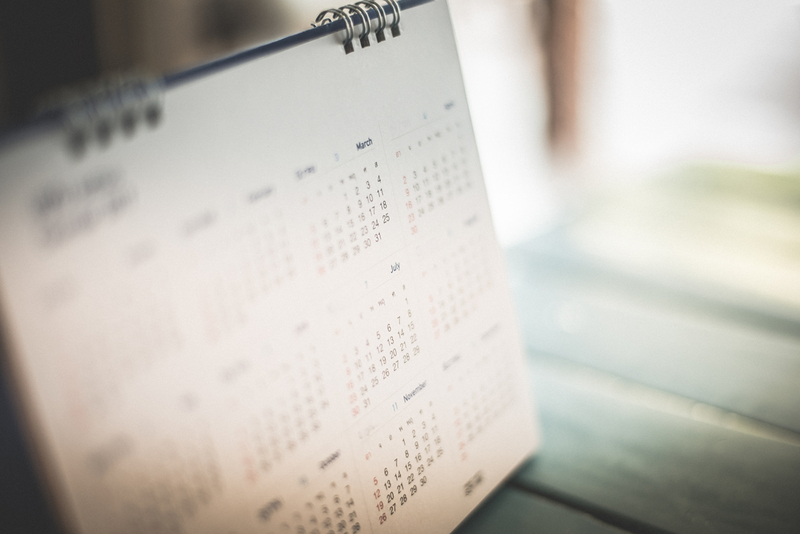 You can take up a canvas board and segregate it and stick paper in each block to create a monthly calendar with the dates and weeks of the month neatly marked. You can put up this calendar in your office, room, kitchen, etc. This calendar is ideal to mark all the important dates for appointments, reminders, notes, etc. handy and keep them handy always. A black board can easily be created into a calendar with some innovation and creativity. You can create a weekly or monthly calendar from a blackboard depending upon your requirement. And the best part is that you can reuse the calendar again and again by just changing the days and months of the calendar. And it is very easy to make too. A calendar can be made out of many things around us, and a wooden cigar box is the best example. It will look elegant and can double up as a decorative piece for your bedroom or living room. You can put small cards in them related to each month of the year. These monthly cards can then be stored in a wooden box in a neat and organized manner. You can keep it in your living room, office or your room. These calendars allow a high degree of customization, and reflects your personality. Suppose you have to send a fax to someone along with the relevant fax cover, you can use these calendars to mark all the relevant dates rel;ated to the fax and send it to the recipient. Calendars need not be boring and can be decorated and turned into eye-appealing decorative pieces which can change the look of your home. If you are an artist or a creative person, then you are sure going to find this calendar ideas useful. So whether your choice is quirky or simple, you can choose an idea from above and start making your own calendar. It will serve both purposes, as a decorative and aesthetically pleasing object and as productive tool to set reminders or schedules.